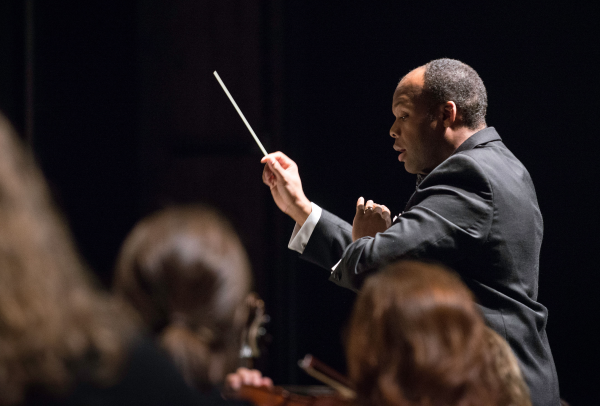 G. Phillip Shoultz, III is the new full-time Associate Conductor of VocalEssence. His expanded position with our organization is one that we hope will have far-reaching impact on both VocalEssence and our community. Phillip replaced part-time VocalEssence Associate Conductor Sigrid Johnson, who announced her retirement in February 2015. Phillip’s first official foray as Associate Conductor will be at the VocalEssence concert Dreams of the Fallen in October 2015. He will also serve as artistic leader for the VocalEssence WITNESS and ¡Cantaré! programs, rehearse with the Chorus and Ensemble Singers, and conduct the 2015-2016 River Songs and Tales tour. This year, Phillip will work with the group part-time as he finishes his doctorate. The winner of the 2015 National American Choral Directors Association (ACDA) Graduate Conducting Competition, Phillip is pursuing a doctorate degree in conducting at the University of Minnesota where he conducts two choral ensembles. He sings professionally, adjudicates vocal festivals, and frequently appears as a guest clinician and workshop leader. Recently, he was awarded an F. Melius Christiansen Graduate Study Scholarship by the Minnesota chapter of ACDA, participated in the inaugural Weimar Bach Cantata Academy with Helmuth Rilling, and was selected as one of six Conducting Fellows for the Oregon Bach Festival this summer. In addition to joining VocalEssence, he is director of music, worship, and the arts for Good Samaritan United Methodist Church. He lives in St. Louis Park with his lovely wife, Michelle (a native Minnesotan! ), their adorable 21-month-old son, Malachi. Phillip earned degrees with high honors from the University of Georgia (B.A. and B.M.) and Georgia State University (M.M.). During his time in Atlanta, he served as Artistic Director to an adult community choir (Gwinnett Choral Guild) and a youth organization (Atlanta Institute for Musicianship and Singing), founding director of the Georgia Young Men’s Ensemble, a part of the Grammy Award–winning Gwinnett Young Singers, and the Assistant Director for the professional chamber choir, Coro Vocati. His work in public schools garnered school- and county-level Teacher of the Year honors on three separate occasions by different organizations.